It seems many do not look beyond carbine production when looking at the manufacturers. Case in point, how many know that the Saginaw Steering Gear Division of General Motors also produced the Browning 1919a4 .30 Cal machine gun? So the quiz here is what else did Underwood Elliot Fisher provide for the war effort besides the manufacture of the M1 carbine. Let us look outside the carbine box! Edit to add: what I am looking for here is items produced for military contracts. Stump me on UEF for 5 points. Points on a sliding scale for items I am aware of but you provide information to back that information such as links or documentation that I have not seen. The obvious is they made typewriters that were used by the US Govt in WWII. They also made payroll/accounting machines that used an early for of punch cards that contained employees payroll information. These payroll/accounting machines increased the productivity of the payroll departments in the companies that bought the new "computer". 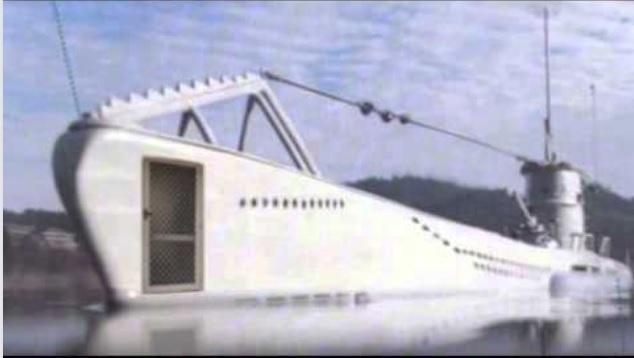 Did I mention they also made screen doors for US Navy ships and submarines. They made a giant typewriter for the 1939 Worlds Fair. What this link does not say is that this enormous typewriter was later scrapped for metal to be used for the war effort. For a peek at a list of other items made for the war by UEF check out WB page 111. Obvious they made typewriters????? When did they make typewriters? The typewriter industry ceased production in October 1942 to help with the war effort. However, you are not wrong in them supplying what they could. As a matter of fact, the American Legion had a drive to collect typewriters to get them to the armed forces. I may be wrong, but are you thinking of IBM for the punch card computer? EDIT TO AD: There was an advertisement article in many newspapers in 1942 titled "a victory on the production front that was won Before the War! I have not found a legible copy yet. What I can make out is that in that time there was a new payroll deduction that affected millions. UEF Sundstrand got it together to get their payroll machines to do this. Love the photo of the Italian submarine; no more need be said. Here is a link to an old WWII era advertisement for the Underwood Sundstrand payroll/accounting machines. It was not a computer as we know them today. Just a punch card data reader. Underwood was subcontracted to make bolts for H&R M1 rifles. "Underwood did make payroll, accounting and adding machines(look into Underwood Sundstrand "
"a new payroll deduction that affected millions. UEF Sundstrand got it together to get their payroll machines to do this." Sorry, I'm not quite sure how to highlight and reply with quotes. Before World War II individuals who owed federal tax on their income earned in a particular year paid the tax during the following year in quarterly installments. Known as Pay as you go..Proposed in 1942, becoming law in 1943, Employers pulled Fed Income Tax from the source... Employees checks. Plus the additional 5% tax increase known as Victory tax. I'll assume these new payroll machines were capable of calculating and pulling the 'New Fed Income Tax Withholding' from the employees check? And pull installment payments for War Bond and Stamp fees that the employee may have requested ? At this same time Underwood wasn't making Typewriters but still wanted to keep their name and products in the consumers thoughts (like most US manufacturers). Instead of slowing down they increased their advertising using the patriotic ads and took advantage of the tax deductions offered by the IRS. These patriotic ads greatly increased War Bond sales. Advertisements featuring the sale of war bonds, conservation, nutrition or other government objectives and are clearly signed by their corporation, the advertisement will be considered as institutional or goodwill advertising of the manufacturer and hence, deductible, provided, of course, that the expenditure is reasonable and not made in an attempt to avoid proper taxation. The IRS ruling and clarification in August 1942 cleared the way for advertisers to benefit from a tax deduction as long as the company did not promote a specific product or service and carried a war theme. I am not up on the M1 Garand subcontracted parts, However, if you are talking the H&R U.W. marked bolts I believe that to be Universal Windings subcontract. Also, I should have been more clear in that I am talking about what Underwood contributed to the WW2 effort. H&R Garand was a Korean War era. @ Charlie, If you wish to quote look above to the right of the post you wish to quote. Hit the "Quote" button and it will populate a reply with quote. Interesting stuff on the payroll deduction, but this was more for workers, thought the GI might have also needed withholding. I may be stumped on Underwood "Computer" or was that just a reference to the card punch machine that would be used with something like the IBM card reader computer? @ Bruce, Thank you for the link, was able to piece together a copy. 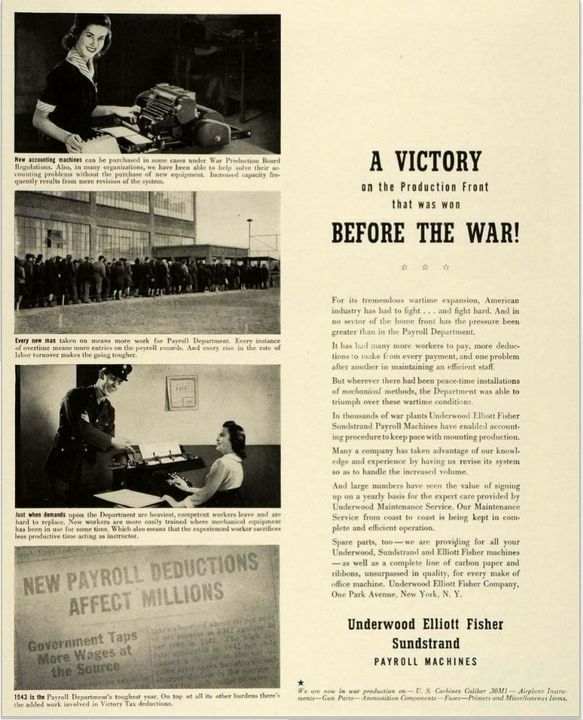 Here is a War Bond advertisement that Underwood used. And check out this beauty! Read this morning that private ownership of Typewriters required an ok by Gov officials during WWII. Without the proper forms they were considered illegal . War Production Board Conversion Order of Aug. 4, 1942 Prohibited the manufacturing or assembling of typewriters after Oct. 31, 1942. As a result of this order, the typewriter industry has been converted over to the production of strictly military items. Underwood made available to the Navy typewriters that they produced and stored before they ceased production. June 6, 1942 E.J. King, Commander in Chief, United States Navy ordered commanding officers of all Navy vessels to give up half of their typewriters. This was to afford one typewriter per 127 men on the battleships. This compared to 1 in 5 in civilian use. There were other articles as well in other publications pointing out the military need of 600,000 typewriters for the war effort. 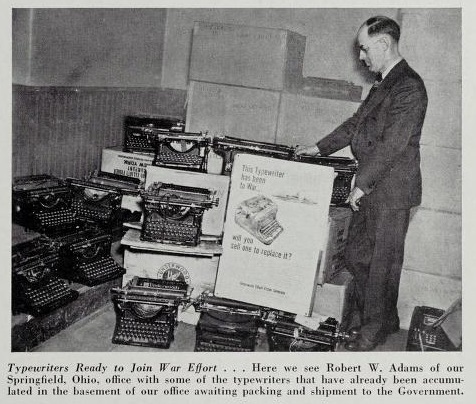 Underwood used over 2000 of their salesmen in over 400 cities to help the Government acquire typewriters for the fighting forces. As mentioned above drives were done to get as many as needed. You are correct on the curtail of private ownership of new and used typewriters. I cannot find that info right now but basically, you could get permission to rent on a need basis. this helped so others could get access to typewriters. I believe I've lost track of your initial question ?? This belongs to us now !! Universal Windings did make bolts for H&R, marked U.W., howerever Underwood .U. HRA bolts are the most common. Not WWII but I thought it to be a worthy mention. Great stuff! Now I have to add Korean era production to my list of Underwood made items. What the club would really like to nail down is when Underwood did its rebuild program. I once found an online want ad for Underwood looking for workers for its "Bolt" program. Unfortunately, the computer soon after crashed and that info was lost. So now wondering if this was the Garand bolt program? Did they make the post-war carbine bolts at the same time? Did they do the rebuild at the same time? One answer at times makes for many more questions. Here's a link to a 1943 Underwood Elliot Fisher Newsletter that has an article that discuses the 25th anniversary of the president of UEF and his contribution to the war effort (see page 1). In the article it mentions that UEF made various aircraft instruments, gun parts and munitions such as fuses, primers, etc. It reports they made aircraft engines during WW1. Other articles in this issue also mentions these same same contributions framed within other topics. The “Bridgeport Briefs” section (page 9) discusses the Bridgeport Works excellent quality record allowing the armed forces inspectors to discontinue their duplicated inspection. A cute cartoon about the payroll machine referred to by BER911 in the Fun Stuff thread (page 16). Page 24 and 25 show pictures of AA Gun parts along with carbine parts that UEF made along with a pic of G.I.’s and their carbines. Thanks to Dan. He inspired me to take a second look at WB3 where I found another reference to wartime contract activity. "We also produced Rate-of-Climb Indicators for the Army Air Corps, bomb fuses, anti-tank components and other ordnance items as well as vital components in the B-29 and A-26 bomber program, such as the automatic gun charger and wiring devices used in the fire control system of the B-29 and A-26 bombers."